Give your door a cheerful holiday makeover this season! 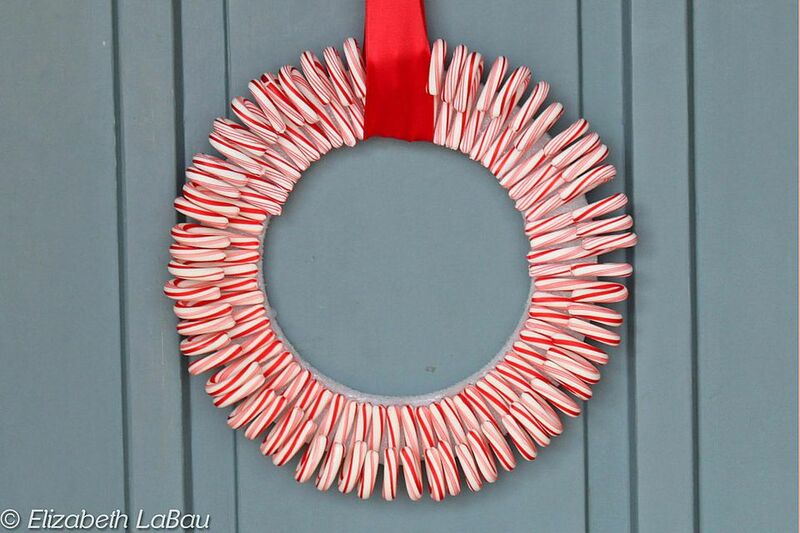 Small candy canes are used to create a lovely red-and-white striped candy cane wreath. Enjoy the beauty of this long-lasting candy cane wreath all throughout the Christmas season! ​Start by gathering your ingredients. You'll need miniature candy canes, of course--the exact amount will depend on the size of your wreath, but for a 12" wreath you can count on using about 80-100 mini candy canes. You'll also need a styrofoam wreath form (available at craft stores), hot glue, some ribbon, and a clear sealant like Mod Podge, to protect the wreath. You could possibly use other types of craft glue, but hot glue hardens quickly so the candy cane wreath comes together in a flash. Unwrap some of the candy canes (you might want to hold off on unwrapping all of them, in case you don't need them all.) Start gluing the unwrapped candy canes to the outside of the wreath, with the crooks on the outer edge of the wreath, pointing up. Because of the way wreaths curve, the candy canes won't be able to touch each other from length to tip. Instead, place them so that they touch at the inner edge of the wreath (the non-curved tip) and then naturally diverge a little at the curved tip. When all of the candy canes are placed, the slight gaps around the outer edge won't be noticeable at all. Continue to glue the candy canes to the wreath until the entire front surface is covered with candy canes radiating outward. Brush a clear craft sealant, like Mod Podge, over the candy canes and let it dry completely. This will protect your wreath against humidity and prevent your candy canes from liquefying in humid environments. Despite the sealant, this is still a wreath that is best displayed indoors, or during dry weather. Once the sealant is completely dry, loop a wide ribbon through the middle of your candy cane wreath and proudly display it! If it has been sealed properly, and if it is kept from inclement weather, you can enjoy this candy cane wreath for many Christmases to come. Gingerbread Rum Balls - Classic Rum Balls With A Holiday Twist!